Plymouth, Minnesota: Medical systems require quality components that are made to exacting and consistent standards. The ServoClass Couplings are designed and manufactured to the same high standards. They will not only perform to the technical levels as advertised, they will be highly consistent and repeatable in every dimension, tolerance, and material specification. ServoClass couplings are the ideal coupling for the precise positioning requirements in today’s demanding medical servo motor applications. Typical applications include scanning systems, X-ray equipment, packaging, and nuclear imaging systems. ServoClass Couplings from Zero-Max feature fail safe clamping hubs that provide maximum torque transmission in high speed applications. 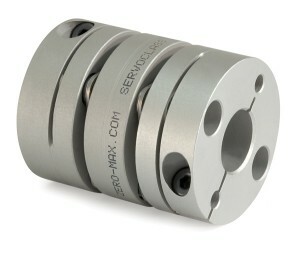 ServoClass Couplings are designed to provide superior shaft engagement without the use of keyways. ServoClass design features include precise 304 stainless steel disc members. These are aligned and locked precisely into position onto the high strength aluminum alloy hubs with ISO 4762 XL 12.9 corrosion resistant socket head cap screws. The coupling assembly process itself is controlled with a computerized torque control system for the most precise fit of all components. Zero-Max ServoClass couplings have an elegant, yet robust design that performs reliably in 24/7 servomotor applications. They are a better choice when the application cycle becomes faster. The wind up in beam couplings and the fragile nature of bellows couplings can be come serious problems in medical system applications. For these reasons, Zero-Max Servo Class couplings are ideal for a wide range of medical, lab automation and medical equipment manufacturing applications utilizing servomotors. Standard off-the-shelf ServoClass couplings are available in 14 sizes with torque ratings up to 2,213 in. lb. (250 Nm). System designers can select from combinations of both inch and metric bores that are available off-the-shelf.